Have you overlooked YouTube in your social media strategy? Interesting post from one of our Corporate Sponsors, Ann Michaels and Associates, on YouTube. Is your company on YouTube? YouTube is the second largest search engine in the world. A recent YouTube study revealed the following stats: 67% of YouTube users go there for help on how to fix their home, 65% use the platform to be entertained and 56% of its users go there to learn something new. With the massive increase of content being added to the platform every minute, brands need to start targeting content as an active strategy if they want to be successful on the platform. People watch a billion hoursof YouTube every day. YouTube still offers the best opportunity for brands to reach their target audience via video. For example: Say you are a soap company, and you want to use YouTube to sell more soap. Maybe one “avenue” would be Education—you want to educate people on why soap is important. Another “avenue” would be reviews—you want to review the best soaps on the market, and then direct people to where they can buy them. As soon as you start thinking this way, you’ll find it much, much easier to come up with not only quality content but content that always falls in line with your larger strategy. The following five steps can drastically improve your YouTube marketing strategy. 1. Do Your Research Before you start publishing your own content, look around at who else is playing in your niche or market, and what they are doing to succeed. Make sure you have a good grasp on your competition and what sort of content they’re putting out. 2. Find your Best Content Avenues YouTube marketing really comes down to picking a few key areas where you feel you can deliver the best value and mass producing content that falls within these areas. That’s why subtitles are so important. You want as many people as possible to watch your content and by providing all methods of viewing you are ensuring a big win. 3. Create a Content Schedule The golden rule you need to follow is simple, and yet it’s the most difficult for brands to execute. Volume…Ask any full-time YouTuber, social celebrity, or brand on YouTube and they will tell you that their viewership rose as soon as they started increasing their volume. The best advice for creating a content cadence is to set the tone from the beginning and let your audience know what to expect. Introduce yourself and describe what sort of content you will be publishing and how often. Then make sure you follow through. Once the cadence is established, your audience will make a habit of checking your channel on a weekly, daily, or sometimes even hourly basis. And the more times they come back, the better. If you aren’t consistent, you’ll never build a loyal audience. Period. 4. Add Subtitles to Your Videos One of the newest and best tools that Facebook and YouTube have integrated into their video uploading capabilities is the ability to add subtitles. It may not seem like a big deal, but here’s why it’s important: most people watch videos on their phone, in public, without the sound on. If you can’t hear what is being said in the video, you’re going to skip it, right? YouTube users arrive ready for video content. They’re more likely to stick around longer, provided the video holds their attention and fulfills its promise. Furthermore, Google loves YouTube videos, and you can compete for a spot in those rankings with videos of your own. 5. Collaborate One of the most effective ways to get your content viewed and shared is by collaborating with other people who have audiences as well. The biggest YouTubers and successful brands are well known for collaborating. It is a win-win for everyone involved. When you collaborate with someone else who has a similar audience as you, they get exposure to your audience and you get exposure to theirs. Ready to give YouTube a try? Implement these strategies and watch your brand and audience soar. What are hot research challenges in social media analytics in health care? originally appeared on Quora: the place to gain and share knowledge, empowering people to learn from others and better understand the world. Understanding and preventing the flow of misinformation. Linking patient-generated social media data with personal health records or the electronic health records for the care team to get a comprehensive picture of patient’s health. Providing personalized social media-based interventions to patients. Performing predictive analytics and real-time predictions for things like flu trends, etc. Sheer volume of the data generated. Specific vocabulary for specific platforms, e.g. use of slang terms like LOL, etc. This makes analysis very specific to each platform and generalizability becomes questionable. It’s hard to estimate if user online behavior is consistent with their behavior offline. It’s hard to estimate if users practice what they preach bringing into question the use of such data as a measure of health. Privacy concerns also exist. Even though social media posts are on public website, users may not appreciate their posts being used for research. Social media analytics is still at the research stage for text based social networks like Facebook and Twitter. Whereas social networks that are available have moved ahead to speech based (Second Life) and image based networks (Instagram). This keeps researchers a decade or two behind with lots of technology to catch up on. We are excited that Tatiana Tosi, the Latin American representative of the Social Media Research Association is a nominee for the Best eCommerce Professional category for the upcoming Brazilian eCommerce - Professionals in Social Media Awards. Nominations are being voted on through April 6th - please help us support Tati by taking a moment to vote for her. You can do so below. Thank you for your support, and good luck Tatiana! I am a follower of AI (Artificial Intelligence), the next groundswell of technological development. Recently, I posted on my company blog, Save The Planet, https://smartketing.com/2018/03/07/save-the-planet/ how AI will help solve some of our planet’s threating environmental challenges. Being a marketing geek, I am always aggregating content for clients to help them better understand the benefits of social media monitoring/analytics. I was not surprised given the amount of data Facebook has amassed on Instagram users, that it was only a matter of time before AI tools would surface utilizing visual recognition to slice and dice Instagram posts to predict consumer behavior. Welcome “Eat Your Feed” an AI tool launched by Unilever’s Knorr brand. The AI tool developed by one of their creative agencies, scans an individual’s posts to provide personalized recipe suggestions from the Knorr database. Users can save the recipes, add ingredients to their shopping apps or share the recipes with their followers. To promote the tool, Knorr has created a FOMO (Fear of Missing Out) promotion, a one-day pop-up restaurant (4/11) in London where diners will be served their favorite Instagram meals, plus have the opportunity to snap and share photos. AI tools sound like a great way to analyze Instagram posts to predict consumer behavior across a broad range of products and services. AI tools utilized to analyze Instagram posts also sound creepy. Big AI is Watching! UK – Social media research is a viable, maturing form of market research and no longer resides on the "lunatic fringe", according to Jay Owens, research director at Pulsar. Owens was speaking during a panel session at the MRS annual conference, Impact 2018. 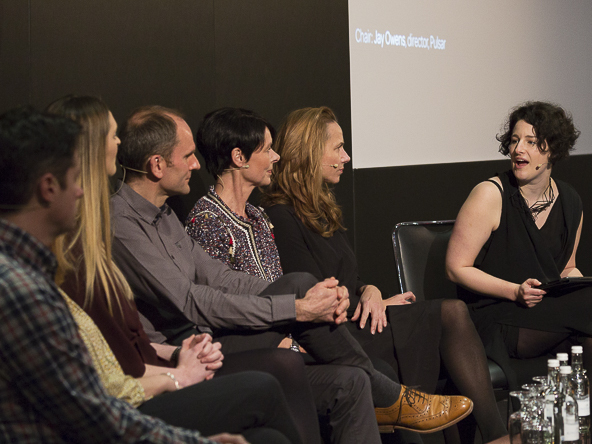 She was joined onstage by a number of research agency professionals and client marketers, the latter from Ikea, Axa and Channel 4. The three brands presented a case study each showing how they had used social media research in their marketing campaigns. Owens reflected on the maturation of social as an insight tool. "Social media research is practically a teenage research method," she said. "Both Twitter and Facebook are about 12 years old and I've been working with them for seven or eight years." She talked of the "evolution of social insight", but highlighted the "need to work out how to do insight better" and turn the discipline into "something that’s going to make a difference and persuade a CMO" of its efficacy. While the benefits of data gleaned from social are of clear benefit to researchers, "answering the bigger business questions and persuading people to use the right metrics" are clearly challenges, as are issues such as data protection and incoming GDPR legislation. Ikea’s Agnes Gawel, who heads up digital performance at the Swedish furniture retailer, talked about how the group employed its bespoke Eva tool, "We learn so much from social media users, getting to see the company’s products in their homes," she said. "They can then use the tool to "analyse engagement and popularity, which then influences our communications and even our products". Social imaging helped Ikea "uncover new areas", "understand how people live at home" and by analysing images, establish what content people find most engaging. Social media engagement is also helping players in insurance. Emma Crowle, senior insight manager at Axa Global Healthcare, talked about how the company thought about social as "the spark that ran through marketing activity, helping us delivery marketing more effectively". A recent campaign led to a 13% increase in quotes and 16% decrease in the cost of acquisition. Channel 4 discussed how using social including Facebook helped it boosted the profile and usage of its Channel 4 News video channel. The campaign was not just a "numbers game" for viewers, but a means of proving its viability as a public service broadcaster. Market intelligence (MI) refers to data that uncovers information about a product’s market, which is then used to shape strategies around advertising, market penetration and new products. By devoting time and resources toward gathering and analyzing MI, some companies have been able to rise above their competitors. However, despite the many uses of market intelligence data, experts in the field today have access to more useful customer data than they can reasonably analyze. This is known as the Big Data Paradox. To learn more, checkout the infographic below created by New Jersey Institute of Technology’s Online Master of Business Administration degree program. Facebook launched “Groups for Pages” in summer of 2017, which enabled Pages to set up private groups for their brand or page. Facebook says about a billion people use groups every month. Groups are attractive to brands because they combine community with “authenticity” — and retailers like Fleet Feet, bike brand Peloton and kitchen gadget Instant Pot have started Facebook Groups. At Peloton, 64,000 people are part of its Group, and community managers of the Group lead conversations about favorite instructors, biking gear, and fitness goals. The Instant Pot Group, which has 1.2 million members, includes recipes and “commonly asked questions.” Facebook’s recent Group initiative puts more emphasis on “active” participation over passive engagement like views. Customers and users become more engaged by having discussions, leaving comments and sharing ideas. Another reason brands are drawn to groups is that the analytics within groups can show much more interesting data. On a higher level, group owners can get more information from an audience with real, demonstrated behavior. With Group Insights, which shows owners everything from who is active to when users are active, brands can build more of a publishing strategy. Dana Flax, a director on the social and marketing team at HBO, which was the first “brand” to use groups for “Big Little Lies” about a year ago, said she found that a group was the right venue for people to “interact.” The hardest part, said Flax, was promoting the group outside Facebook and in the news feed; using influencers — or the show cast, in HBO’s case — to make that happen, was key. Are you interested in creating a Facebook Group for your brand? If so, consider these helpful tips. Create a group to reward your customers & make them feel special — for example, a group exclusively for people who have purchased your product. Include a link on your sales page or send emails inviting customers to join. Find a way to provide value for group members that will keep them active & participating in the discussion. A group should be about its members & how the group can provide value for them. Chris Brogan’s The Secret Team is one of the best Facebook groups out there. The level of engagement is off the charts! Chris asks customers for their input on brand new products, suggestions on marketing/brading ideas, and gets feedback on troubleshooting problems/issues. When your customers feel like their opinion really matters they are more likely to engage…and get others involved as well. When considering how to start a Facebook group for business, one of the best reasons might be to keep in touch with your biggest fans. The strong relationships you have with your top advocates & brand ambassadors are invaluable. And a group like this lets your advocates connect with each other. Use the group to follow up with customers and always ask them if they have questions or concerns. Let your brand ambassadors test new product features before they’re released to the public and see how they react! A Facebook group is also really handy if you organize or promote lots of events. Let your Group members be the first to know about special events…and watch the engagement skyrocket! Those who attend the activities will use the group to network & share photos & notes. Reward those loyal customers with special discounts or incentives on future purchases. Although Facebook Groups are fairly new, the concept is not. As a brand your goal is to get as many people talking about and eventually purchasing goods or services you provide. By creating a private group for loyal customers, you can reward those who are already fans and provide a deeper level of community. Candidly it is getting difficult to keep pace with the evolution of influence marketing. At the end of last year, I wrote an influence marketing post for the SMRA titled Brand Advocacy 101 https://smra-global.org/news/5605987. I emphasized the importance of employing monitoring tools to identify socially active individuals (a.k.a. brand advocates) who have influence over your brand’s potential buyers. The good news, there has been an increase in the investment/utilization of engagement monitoring tools – currently 45% in total versus 36% of companies and 32% of agencies surveyed in 2016 (source: Celebrity Intelligence). However, once influencers are identified, marketers continue to debate on whether is it better to use macro or micro influencers. Macro influencers are categorized as celebrities with massive, millions of followers, while micro influencers are everyday consumers who have significant social media followings (1,000 to 100,000) they engage deeply with on a regular basis. ·Virtual Influencers – Meet Miquela Sousa, Instagram handle LilMiquela, L.A. model of Brazilian decent, an Instagram “fashionista” with 605,000 followers. She posts daily about designer outfits, as well as social and political issues (e.g., Black Lives Matter, DACA, etc.). Here is the catch. She is not real, she is the computer-animated Instagram invention of unknown digital artists/animators who have made it clear she is virtual and not affiliated with any brands. Followers like her candor, authentic content, in comparison to real influencers they perceive as scam artists. Consequently, brands are beginning to recognize the benefit of partnering with virtual influencers in the future since consumers view them as being transparent. ·UGC Movements – User generated content according to Adweek (85% of survey respondents) is more influential than content developed by brands directly. A good example was Tourism Australia recognizing people enjoy sharing their vacation photos on social media (#SeeAustralia). They jumped on the bandwagon and began engaging directly with Australian visitors, as well as wannabee visitors. Then they implemented a selfie movement (UGC) that resulted in positive website metrics – increased engagement (+30%) and time spent (+66%). Stay tuned. Influencer marketing probably continued to change even as I write this post. I will be back soon with an update. I have been reading more and more about how people are using large scale social network data for predictive analytics in healthcare and most recently, threats to our world. In order to decide if this data is reliable enough to even consider this form of research, two studies are underway to find out. The Journal of Medical Internet Research recently published an article around using Facebook Groups in order to educate patients for type 2 diabetes mellitus (T2DM) and coronary heart disease (CHD). Facebook Groups are thought to be more convenient for patients who are undergoing rehabilitation than on-site groups. It lifts barriers of location and may encourage better peer- to- peer conversations and the exchange of important information. Of course, the Journal recommends healthcare professionals moderate initially and much more work needs to be done, however they feel it is a good option with some real potential for increased insight into both areas. Taking patient's day to day experiences in dealing with both illnesses and their exchange of information would offer some great data for medical professionals. Within our connected world come risks and human behaviors that make it difficult to decipher real from fake information. I am very encouraged by these two initiatives to harvest social data for the good of society in a more controlled setting. Smart marketers recognize the magnitude social platforms contribute to their marketing movements, thus are now exhibiting more discipline (internally or with the assistance of outside resources) monitoring and measuring their products’ or services’ online reputation. Analyzing all the online data is a momentous task, especially in light of current research (source: Brandwatch) indicating 96% of people that discuss brands, do not directly engage with the brands online. Once a company properly filters through all the online data, they are in better position to create a positive customer care experience that yields loyalty. Note: A Social Sprout survey re: a good customer care experience; 75% of the respondents were most likely to share their experience with social connections and 70% were most likely to use the brand or service. Last year (August), I contributed a two-part podcast on Advanced Twitter analytics, a free tool I highly recommend utilizing this tool for marketers responsible for monitoring their company’s online reputation. Therefore, it was exciting to learn that Twitter decided to elevate their game this past Sunday and set an objective of being the top social media destination during the Super Bowl, a titanic event for brand marketing movements. They created #BrandBowl, a place where advertisers and Twitter users congregated during the game. Their goal was to enhance Twitter engagement. In addition, to generate post-game buzz, they handed out awards for the best ads. PepsiCo was the big winner. It was awarded #MVP for the brand (Pepsi) receiving the highest percentage of brand-related tweets and #Blitz for the brand (Doritos & Mountain Dew) that drove the highest velocity of tweets-per-minute. The official Super Bowl 52 Twitter statistics have not been published yet. Nevertheless, #BrandBowl was a clever, substantial way to get marketers to better understand the power of Twitter as an excellent social platform to build a company’s social reputation.